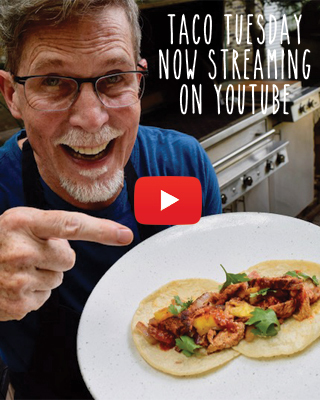 Rick Bayless | Season 10 of Mexico One Plate at a Time: Chef to Chef – Airing Now! Season 10 of Mexico One Plate at a Time: Chef to Chef – Airing Now! Rick’s newest season of Mexico One Plate at a Time: Chef to Chef is airing this January! Check PBS.org for your local listings. How can I get a copy of that delicious saffron rice pork casserole dish which just aired today on the WTTW Mexico One Plate at a Time? Thank you. Love the show!!! Excellent recipes and easy to understand guidance. I saw your show for the first time yesterday and really enjoyed it. You interviewed the chef of Contramar in Mexico City, and the episode started with the chef making a rice and picadillo dish with her aunts. Where can I find that recipe? Thanks! I have been out of the country for many years…gratefully some of your wonderful recipes remain in my memory and are often referred to….the cookbooks are long gone..hopefully soon to be replaced. Hi! I would like to buy all your seasons on video. Do you have them on Amazon or iTunes? Where can I buy all your videos? Most of the episodes are bundled on DVDs, which you can purchase here. We’re also streaming Season 8 and have plans to stream Season 9 in the near future. Just click on the “TV season” archive at the top of the website. Thanks for watching! When Season 10 will be available to purchase? Our shows are still airing, so it will be about another 6-10 weeks. If you join our mailing list (bottom right side of our website) we will send you an email when DVDs go on sale! Since my PBS station (channel 6 in Sacramento) decided to air Season 10 on Wed. afternoon I missed the first episodes. Let me know when I can purchase dads of the programs. Thanks. DVDs will be available in 6-8 weeks. Please check back for information or join our mailing list (bottom right side of the page) and we will send you an email when they become available! In episode 4, Rick watches Jorge Vallejo make a wonderful mole in the kitchen at Quintonil. What is the brand name of that interesting blender that Jorge uses? I can’t quite make it out on screen. Holy smoke, it’s two grand! ¡Salúd! Hi, are you going to be putting any of the seasons on iTunes? I haven’t been able to find the dvd’s in Australia. Do you have your shows available for purchase via ITunes? We travel internationally with only tablets so purchasing the DVD’s is not really an option.